The final part is here! After almost two exciting weeks, in which we presented forty recommendations on our holiday guide, we're happy to bring you the final part with the last 10 recommendations. Just to remind you what the Green Collar Holiday Gift Guide for Book Lovers is all about - we try to assist all the good people who want to give books as gifts this year with recommendations on the best green books to give as gifts this holiday season. We do so by having a very special holiday guide with 50 recommendations of great green-themed books that will be a good fit as holiday gifts. As you will see the guide is not only about the books, but also about the people who recommend it. We tried to personalize the guide as much as possible so we will learn not only about green books but also about the people who carry the green economy on their shoulders. Therefore with each recommendation you will find a personal angle that presents the recommender, his workplace and/or why they chose that specific book to recommend on. As promised, today we present part 5 (last part) of the guide. As you can see today and on other parts of the guide, we have some great people who are part of the green economy and also wrote great books which the recommend on. We hope you will enjoy the variety of offers and find here great ideas for green gifts. Enjoy! What the book is about? (from David Suzuki Foundation's website) We all know the bad news. Every day, along with all the bulletins on social upheavals and terrorist attacks, we read reports of the damage that industrial development is wreaking on our soil, air and water. We seem intent on continuing to live this way, even though many scientific experts tell us our actions are suicidal. The good news is that thousands of individuals, groups and businesses are already changing their ways. A growing number of companies are still making money while benefiting their local communities. The authors have also uncovered hundreds of working solutions that can help all of us to imagine and achieve a new and happier future. There is a spontaneous, global quest for ways to survive sustainably that is opening up a very different planetary future from the one based on endless economic and industrial demands. And, say Suzuki and Dressel, many of the technologies we need to realize our goals—to save species, to conserve soil, to right social wrongs—are already within our grasp. Why would this book make a great gift? Easy to read collection of non fiction stories from around the world, written by a Canadian environmentalist. Offers a glimmer of hope while addressing how much work is required, and the simple small steps that need to happen to get there. Not over complicated, a Good Read! Getting personal: This book was part of my Industrial Design College Curriculum. What the book is about? (Amazon.com review) Paul Hawken, the entrepreneur behind the Smith & Hawken gardening supplies empire, is no ordinary capitalist. Drawing as much on Baba Ram Dass and Vaclav Havel as he does on Peter Drucker and WalMart for his case studies, Hawken is on a one-man crusade to reform our economic system by demanding that First World businesses reduce their consumption of energy and resources by 80 percent in the next 50 years. As if that weren't enough, Hawken argues that business goals should be redefined to embrace such fuzzy categories as whether the work is aesthetically pleasing and the employees are having fun; this applies to corporate giants and mom-and-pop operations alike. He proposes a culture of business in which the real world, the natural world, is allowed to flourish as well, and in which the planet's needs are addressed. Wall Street may not be ready for Hawken's provocative brand of environmental awareness, but this fine book is full of captivating ideas. Why would this book make a great gift? The Ecology of Commerce came out nearly 15 years ago, but it remains fresh and inspiring- and more topical than ever now that businesses have started to catch up with its central insight, that if we ruin the natural world, we'll ruin business. This book is responsible for many notable career-conversions, the most notable of whom is Interface's Ray Anderson. If the person's a neophyte to sustainability, I think this book remains the best big-picture, in-depth view of sustainability and business. Getting Personal: I read it for the first time at the end of 2000, and it changed my life. I've been writing about and working with nonprofit and startup organizations to promote sustainability ever since, and credit Paul Hawken's passionate, clear-eyed vision for giving me the framework for understanding the urgency for going green. I still think it's among the best written and most engaging books in the growing literature of green. Recommended by: Angela Ford, President/CEO, T.A.G. Worldwide, Inc.
What the book is about? 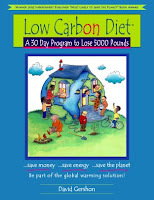 from the book's website): This “30 Day Program to Lose 5000 Pounds” is a fun, accessible, easy to use guide that will show you, step-by-step, how to dramatically reduce your CO2 output in just a month’s time. Grounded in over two decades of environmental behavior change research, this illustrated workbook offers much more than a list of eco-friendly actions. It walks you through every step of the process, from calculating your current CO2 “footprint” to tracking your progress. By making simple changes to actions you take every day, you’ll learn how to reduce your annual household CO2 output by at least 15%. And, for those who are more ambitious, you’ll discover how you can help your workplace, local schools, and community do the same. Why would this book make a great gift? It is a really simple way for a family or novice to begin a sustainable lifestyle. Getting Personal: About Angela (from LinkedIn) - Licensed Real Estate Broker; Sustainability Consultant; Real Estate Property Manager; LEED-AP (Accredited Professional); Climate Exchange initial assessment consultant; an emphasis on the construction, maintenance, management and “greening” of both residential and commercial properties. Why would this book make a great gift? Shumaker's 'Small is Beautiful' remains a good primer, and a useful reminder that today's 'Green Movement' has roots going back decades. In many ways British economist E.F.Shumaker helped provide the philosophical basis for the modern environmental movement, appropriate technology, and sustainable economies. Getting Personal: (from LinkedIn) For over twenty-five years Fred Schlomka has been the chief executive of several companies and non-profit organizations on both sides of the Atlantic including American Caribbean Builders in Florida and Mosaic Communities in Israel. In 2003 he was awarded a Social Entrepreneur Fellowship from the Echoing Green Foundation in New York. He has also lectured on Palestine/Israel issues in Europe and the USA, and his articles have been published widely. What the book is about? (from Eco-Libris review) "Earth: The Sequel" is not only a primer on the various new technologies being developed to produce clean energy, reduce pollution and increase efficient energy use, but also a celebration of the spirit of entrepreneurship around these developments; a spirit embraced and promoted by EDF for several decades since its founding in 1967. Neither a textbook nor a scientific investigation, Earth: The Sequel is more than anything a journalistic journey that follows the unfolding saga of various energy start-ups and technologies through the shifting sands of venture capital, big $$$, crazy R&D dreams and policy nightmares. Why would this book make a great gift? In this environment, this is a great business-centric read. Throughout this hardcopy book, there are very engaging profiles of individuals who are at various levels of blending business practices with an environmental position...It is a great and uplifting read on what we can do at work with a focus towards the race to reinvent energy and stop global warming. Getting Personal: I do not work in an environmental or energy industry, but found the book inspiring in the use of engaging profiles of how others are creatively enhancing their diverse businesses. What the book is about? (from the back cover) It's Easy Being Green is a handy tool to help you make better choices for the environment. This is what the busy person needs to start making changes today. Get informative, comprehensive and practical information for adopting greener buying habits and identifying earth-friendly products; shopping for green products online; participating in online activism; and learning from over 250 eco-tips for cultivating a sustainable environment. Install rain gutters and rain barrels to collect rainwater from your roof to use in the garden. Shift appliance use to off-peak hours. Some utility companies offer off-peak rates! Make your own household cleaners instead of relying on toxic commercial products. Submerge a plastic bottle in your toilet tank to save one quart of water per flush and thousands of gallons a year. Why would this book make a great gift? An easy read with practical tips for everyday actions. I think it is particularly useful for the person who doesn't know where to start. Getting Personal: (from LinkedIn) The Solid Waste Agency of Northern Cook County (SWANCC) is a unit of local government and a non-profit corporation. Twenty-three towns in northern Cook County joined together to form SWANCC in 1988. SWANCC developed a long-term plan to manage the region’s garbage that was adopted by its Board of Directors in 1991. Since then, SWANCC has been at work implementing this balanced and environmentally safe solution to the region’s garbage challenges. What the book is about? 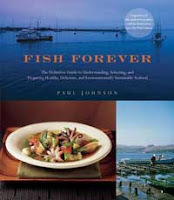 (from Amazon.com) Few people know more about fish than Paul Johnson, whose Monterey Fish Market in San Francisco supplies seafood to some of the nation's most celebrated chefs, from Alice Waters, Thomas Keller, and Michael Mina to Todd English, Daniel Boulud, and Alain Ducasse. Now, Johnson at last shares his peerless seafood expertise. Written for people who love seafood but worry about the overfishing of certain species as well as mercury and other contaminants, Fish Forever pinpoints today's least-endangered, least-contaminated, best-tasting fish and shellfish species. Johnson provides in-depth guidance on 70 different fish along with 96 stylish international recipes that highlight the outstanding culinary qualities of each. In addition to teaching readers about sustainable fishing practices, Johnson will be donating a portion of his royalties to Save Our Wild Salmon, an organization that works to restore wild salmon runs. Complete with over 60 beautiful color photographs, how-to tips, and fascinating sidebars, Fish Forever is a must-have kitchen resource for seafood lovers everywhere. A mutiple award winner, this great book also won the IACP's "Best Single-Subject Cookbook." Why would this book make a great gift? The best thing about giving Paul Johnson's "Fish Forever" is that it includes recipes for almost any fish you might encounter in North America. So it works for your mom in Minnesota and your friend in Florida. Paul's the owner of Monterey Fish Market, which supplies restaurants like Hayes Street Grill and Chez Panisse. He has been a long time proponent of sustainable fishing, but as a businessman, he also knows that he has to satisfy customers who want something "firm and not too fishy." This book will get you to break out of your habits of eating top predators, like tuna and swordfish, and into snacking further down the food chain. Getting Personal: (from LinkedIn) Starting as a phycologist, at the bottom of the food chain, I moved on to the Senate as a fellow on the Oceans & Fisheries subcommittee. From there, I've tackled tuna & shark fisheries, collaborative research, ocean renewable energy, aquaculture, California's nearshore rockfish, and marine protected areas. I'm interested in finding common sense solutions among diverse viewpoints, working with economic incentives to reach conservation goals, and innovations that protect scarce natural resources. * "I Can Save the Earth! : One Little Monster Learns to Reduce, Reuse and Recycle" - The story of Max, a little green monster, and his journey from being a wasteful “environmental nightmare” to environmental awareness. * "The Polar Bears’ Home: A Story About Global Warming" - A father and daughter learn about polar bears, and how they can reduce global warming through conservation. * "Little Panda and Little Monkey" - Little ones will love to cuddle with these super soft fleece cloth books that are made out of cotton and recycled Polartec® fleece. In January, a new book ... "The Adventures of a Plastic Bottle: A Story about Recycling” ... will be coming out. Why would this book make a great gift? This is an eco-friendly line of Little Green Books children’s novelty and storybooks aimed at parents and children looking to learn more about the environment. These books are nicely done ... and they're for kids! Getting Personal: Keep America Beautiful is partnering with Simon & Schuster Children’s Publishing to promote Little Green Books. Eco-Libris is also collaborating with Simon and Schuster Children's Publishing - in a celebration of their new line of Little Green Books, Simon & Schuster Children’s Publishing has partnered with Eco-Libris in an educational contest - I CAN SAVE THE EARTH!. What the book is about? (from the book's web page) Business is coming under increasing pressure from Government, customers and campaigning groups to improve its environmental performance. Soaring oil, utility and compliance costs are hitting companies where it hurts - on their bottom line. But there is another way of looking at the green agenda - as an opportunity rather than a threat. The Three Secrets of Green Business Success. Preparing To Go Green - change management, indicators , communication and marketing. Small Steps - the easy actions that will cut waste of materials, water and energy and save you money. Huge Leaps - the really big changes that will make your business truly green by changing your processes, products and business models. Hundreds of handy hints and tips. Includes brainstorming checklists and brainstorming tool. Why would this book make a great gift? This eBook is practical and although sometimes dealing with technical subjects, its doesn't over complicate. Getting Personal: My business is a consultancy dealing in environmental communications and research, so I do use this book as an aid to research projects or copy writing. Recommended by: Dan Sitarz, the author, attorney, lecturer, educator, and business entrepreneur. What the book is about? Every element of a business’s impact on the environment is examined in this comprehensive book—energy and water use, waste generation, transportation, computing and office equipment, supply chains and purchasing, building practices, and product and service design. The included CD contains dozens of fillable worksheets for developing a comprehensive business environmental plan, many Excel® spreadsheet programs for business carbon emission calculations and other green business strategies, and over 1,500 pages of additional business environmental publications. It retails for $29.95 and is available at Amazon, Barnes & Noble, and other book stores. 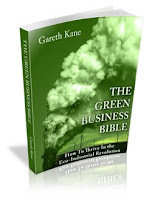 More information about this book is available at: www.greeningyourbusiness.org. Why would this book make a great gift? Greening Your Business: The Hands-On Guide to Creating a Successful and Sustainable Business" would make an excellent gift for anyone who owns or operates a business. It provides a hands-on guide to saving energy, saving materials, and saving money by reducing their businesses’ impact on the Earth. Getting personal: (from the book's website) Dan Sitarz is an attorney, author, lecturer, educator, and business entrepreneur. In 1992, in cooperation with the United Nations Conference on Environment and Development, he wrote and edited the popular abridged version of the central agreement of the Earth Summit: Agenda 21: The Earth Summit Strategy to Save our Planet. This book was selected as one of the top 25 Environmental Reference Books by the Sierra Club (Sierra Club Green Guide) and one of the top 21 Books for the 21st Century, jointly by the International Center for Environment and Public Policy of the California Institute of Public Affairs, The Commission on Environmental Strategy and Planning of the World Conservation Union (ICUN), and the World Future Society (Future Survey). If you choose to give your friends or family this book as a present on the holidays, you are more than welcome to balance it out with Eco-Libris, add our sticker to the book and make it the perfect green gift for the holidays.